Did you know that A Christmas Carol was first published in 1843? It is the book that changed the face of Christmas to what we know it today (read about it in the beautifully written history book - The Man Who Invented Chrismas: How Charles Dicken's A Christmas Carol Rescued His Career and Revived Our Holiday Spirits). I always assumed that it would be a rather long book to read and was surprised when we finished it within a week! It's a beautiful book to read aloud together as a family. I have a few editions on my shelf and today would like to share this beautifully illustrated one with you. It's a part of the Walker Illustrated Classics series. Dickens's ghostly tale of Ebenezer Scrooge has become as much a part of Christmas as trees and stockings, plum pudding and mistletoe. First published in 1843, this lavish, unabridged new edition resonates with the true spirit of Christmas. 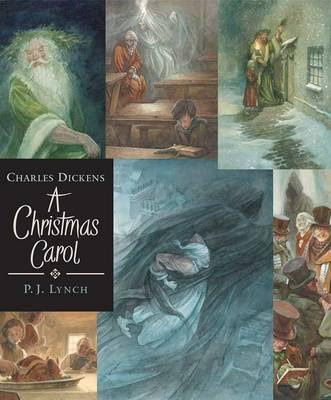 It is superbly illustrated by Ireland's fourth Laureate na nOg, PJ Lynch, whose detailed, atmospheric artwork brings Dickensian London vividly alive.